November | 2009 | let's go pinas!! In a four hectare land area in Davao City, at the vicinity near the Pan-Philippine Hiway and just some distance away from, the Gaisano Mall, the city government boasts its relatively new, Davao City People’s Park, a worthy must-see for first-time travellers. Using the old PTA grounds, Davao City’s Mayor Duterte spearheaded the newest urban attraction that impresses its people with thoughtfully designed landscaping which employs the Philippine bamboo and rainforest trees, from different parts of the world, particularly from Africa and Asia. Perhaps all throughout the day, the park becomes a haven for joggers and health buff. The old oval track, which used to be all muddy during the rains, is now restored, utilizing bricks and mortar as pavement. Runners should appreciate the greens and foliage surrounding the area, and be pleased with flocks of pigeons, fluttering above. People will not miss the vignettes of statuettes of cute children, in traditional costumes scattered strategically in the park as part of the garden plan. These are sculptural representations of Lumad children doing different life activities, such as fishing for meal, harvesting and farming, and balancing on stilts as part of their traditional games. The Lumads are the indigenous people of Southern Philippines, and have been descendants of the original inhabitants of the areas in Mindanao. The Lumads such as the T’boli, the Mandaya and other cultural groupings dot the vast Mindanao island, and have contributed to the rich and diverse cultural identity of the Philippines. 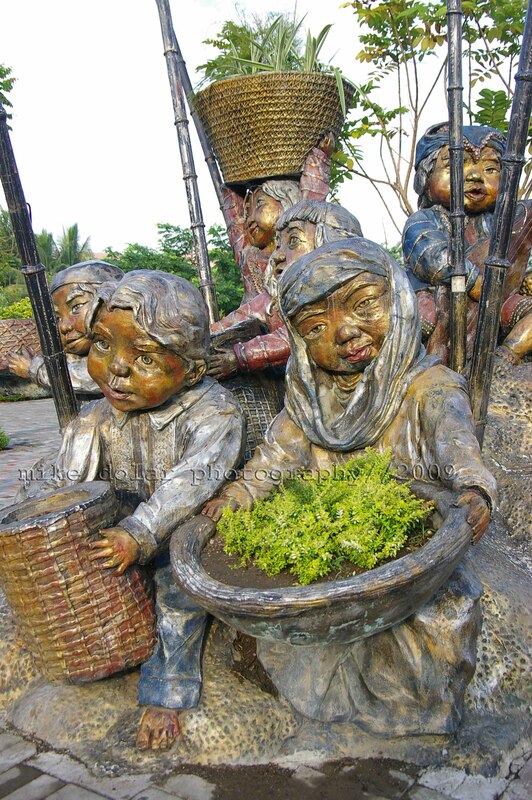 Kublai Millan, young Davao based sculptor, ably provided the sculptures of the young native kids having cherubic faces, including their buggy eyes. Definitely, heart warming and adorable, such depictions illustrate the gentle and tender nature of our ethnic brethren. Against the usual tradition. If you just want to roam around Sta. Fe, then the padyak (foot pedalled cab) will suffice enough. But if you want to visit the two other towns, like Bantayan Proper, then you need to hop on to a motorbike, and hold on to the driver for an easy ride. In Bantayan Proper, this is where you get extra cash when needed. There is an Allied Bank Branch which dispenses money at its ATM (automated teller machine). Of course, even in the resort hotels of Sta. Fe, there are credit card facilities as well so pretty much, money may not be a problem in the island once it becomes depleted. But in Bantayan Island, people don’t run out of being spiritual and being religious. It is manifested in its coral-stone edifice of the Church of Sts. Peter and Paul. At 430 years old, it is the oldest church not only in Cebu but in the whole of Visayas and Mindanao. It is a magnificent architectural and heritage piece constructed by the Augustinian friars. Inside, stone statues abound which depict saints and their lives. More often, the wood carved statuary are used as decorations in the interiors of other Philippine Churches. There you get to see old ladies sell candles, and young men play basketball at its four quadrant plaza. If its church is inspiring, you may a little bewildered by its atypical Holy Week ritual. People of Bantayan Island are exempted to abstain from eating meat. In fact it is said that there is a Papal approval by LeoXII during the 19th century allowing the people to feast on chicken, beef and even Lechon even on Good Friday. 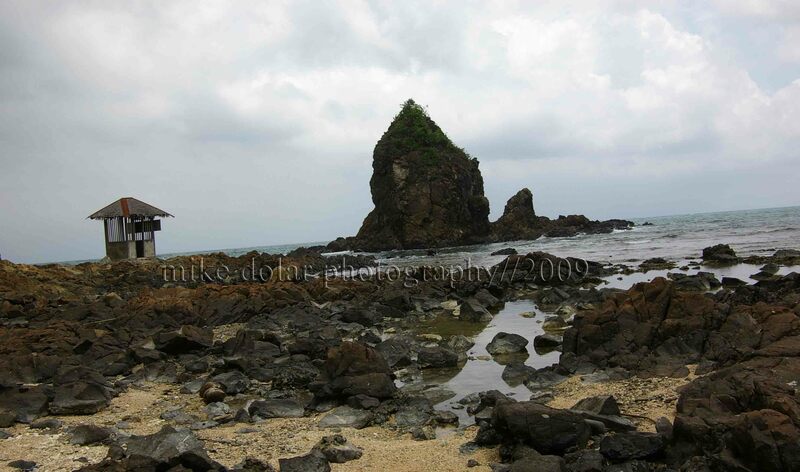 Apparently, people during the Spanish colonial period had to ask the Pope for such immunity from the usual Lenten practice, as the fisherfolk during Holy Week would skip going out to the seas to catch fish to observe Lenten Season. Although the reason may be a little convoluted, you will be just in awe at how piously people observe Good Friday as life-like statues which illustrate the passion of Christ’s crucifixion parade through the streets. She dashed softly into the set alone. She would drive by her own, and would need no personal assistants. And she was very well on time for the 1pm photoshoot and interview appointment. She is Bianca Gonzales, the young, vibrant and well-admired tv personality who has made a name for herself through hosting a series of shows that are geared to the young and the young minded. At the moment, she is seen in “Y-Speak” and “E-live,” a showbiz oriented program every Saturday afternoon. She was also very much a part of early morning programs like “Breakfast” in Studio 23, and “Magandang Umaga Bayan” in ABS-CBN 2. In the Cinema One Cable Channel, she was part of “Review Night” where she provided movie reviews on Filipino Films. With the Youth In “Y-Speak” Bianca generally talks about issues and concerns of the Filipino youth and the young adults today. She has been moderating the town meeting debate format within the show. And she knew early on, she would be doing fine in a show that delves primarily about matters on politics and society since she was the one who is not bored, reading the newspaper to be aware of what is happening. It was in college when she started her blogsite. The blog has given her that avenue to speak her mind through the writings and the pictures taken by her trusty Canon 400D digital camera. Bianca acknowledged that during her college years, she had been very much into her studies. She took up AB Communication Arts, with a minor in Philosophy at Ateneo de Manila. She was not the one who got intimidated with such esoteric courses that she had even chosen the “tougher” instructors. She remembered that she was in awe by Dr. Leo Garcia’s Philosophy 101 subject that by the time she graduated she had taken 6 Philo classes under him. If Bianca was quite intense with her college education, in her highschool years at La Salle, Zobel, she had enjoyed her stay much more. While she was in the honors section all through out her stay, she was still able to participate in “cool” activities such as being part of the cheerleading squad. And her joining gave her chance to mingle with other batches despite her being shy and reserved. She intimated that truly she was quiet and even kinda geeky in highschool. But she was a cheerleader then, and that gained her some popularity points. Still she downplayed the importance of being “popular” particularly during highschool life. Prod Work And while she was in school, Bianca dabbled much in writing and the different aspects of media work. In La Salle, she wrote scripts, and directed stage plays. In Ateneo, she was part of the yearbook project, and would produce films as part of her college course. She felt strongly that could do production work, particularly behind the cameras after college. Consequently, it was no surprise that even by third year college, Bianca applied and was able to work in ABS-CBN. She was one of the brainstormers whose task was to conceptualize new shows and formats for television. However it had been her brother, JC Gonzales’s stint as host for the morning show “Breakfast,” that actually inspired Bianca to aspire for the same job. She thought that if Kuya JC could host a morning show, she could hack the same job as well. So she grabbed instantly the opportunity to be on television screen once an offer had been given to her by ABS-CBN. In 2003, and in her first television emceeing job in “Y-Speak,” together with Karen Davila and Ryan Agoncillo, Bianca needed to be quick in her thoughts. She recalled that there was a need for her to synthesize ideas brought about by the guests and audience. Then she would give a short summary at the end of the show. And up to this day, she is very grateful to her cohosts for supporting a newbie like her. Among the prominent tv personalities, it is her talent manager, Boy Abunda whom she considered as one of the best in tv hosting. For her, Boy would be able to talk on a certain topic for several hours and still be stimulating. She remembered a piece of advice from Boy Abunda on hosting. For Bianca, Boy’s piece of advice meant that a host has to be truly fascinated in a variety of things. A host is not to be unaware about a certain topic that he primarily should know about while hosting. In other words, research and reading are key elements of a good anchoring job. At the moment, she is also enjoying her presence on tv as a host in less serious tv fare, particularly in “E-Live.” Here, she is part of a triumvirate of ladies, already having had the taste of early success in anchoring reality programs such as Pinoy Big Brother Editions. Bianca acknowledged that she and her cohosts, Mariel Rodriguez and Toni Gonzaga, have different approaches in their jobs. Toni does her hosting chops with authority. Mariel provides comical bursts and energy. Bianca dishes out the analytical and serious stuff. At Home Yet even before Bianca was among the hosts of several editions of Pinoy Big Brother, interestingly, she had been one of the 14 housemates of the 1st Pinoy Big Brother Celebrity Edition (PBBCE) in 2006. In this show, she had to do backbreaking and sometimes insightful tasks for Big Brother, or “Kuya” with 24/7 cameras all over the house to the relish of every reality television aficionado. And since then, Bianca’s name became too popular that people were clamoring for her to act in a film or a teleserye. But until now, she nixes the idea. She has never aspired to be an actress. And if she is not passionate about it, then she just can’t force herself to be one. At her own place, she appreciates the downtime. She just lazes around while watching CSI on Fox Crime Channel, or travel documentaries on Discovery Travel and Living Channel for hours. Every morning, her Mom wakes her up, and she goes right away for a cup of coffee. Then she checks on her emails and blogsite. She does not go to the gym, but instead runs in a treadmill in her home. And by noon, she is off to ABS-CBN. She admitted that she would rather stay at home than go out, if she has time to relax. If she does go out, she would go to her favorite nearby mall – Alabang Town Center to walk around or to be at her friends’ houses for quiet dinners. At her very core, Bianca is the self effacing young woman who wants to enjoy peace and tranquil times. There is almost a calming effect once you get to chat with her. She is never forceful nor loud. But in every chance she talks, there is so much in her being that expresses volumes.